TERRE HAUTE, Ind. - Indiana State University's Performing Arts Series wraps up its 2009-2010 season on March 20 with "Oh Mr. Sousa!," a staged band concert show, highlighting major historic and amusing events in the life of John Phillip Sousa. Some of the world's most beloved music will be heard during the two hour show at 7:30 p.m. in Tilson Auditorium, which will feature an appearance by the Terre Haute Community Band. Sousa began by taking violin lessons at age 10 and by the time he was 13 he could play numerous band instruments and already was conducting his own 7-piece orchestra. That same year, his father, John Antonio Sousa, himself a musician and concert trombonist, enlisted him in the United States Marine Corps Band as an apprentice to prevent the young musician from running away to join a circus band. Sousa's first composition, Moonlight on the Potomac Waltzes, was published in 1872. El Capitan, the most popular of his comic operettas, composed in 1895, ran for over four years and became a hit in Europe and Canada. His other operettas fared less well, and he eventually turned his attention to his band, for which he composed 136 marches. Because of his success in that area, he is known as "The March King." 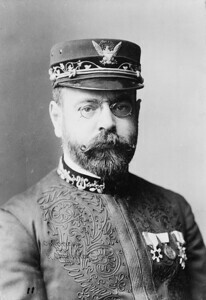 He assumed leadership of the U.S. Marine Band in 1880. During his 12 years in the White House as leader of the Marine Band, Sousa served under five presidents - Rutherford B. Hayes, James A. Garfield, Chester Arthur, Grover Cleveland and Harrison. At the peak of his popularity, he was playing to crowds in excess of 150,000 and constantly touring, both nationally and internationally. He literally conducted until the very last day of his life, at age 77. The last piece conducted under his baton was his own beloved "Stars and Stripes Forever," which in 1987 became designated as the official national march of The United States of America. Tickets will be available at the door. Adult tickets are $16. Tickets for youth ages 2-18 are $10. ISU students are admitted free with a valid student ID and are invited to participate in a punch card program. ISU Faculty/Staff tickets are $15. Tickets are available in advance at the Hulman Center Ticket Office or online at ticketmaster.com . For further information call 1-877-ISU-TIXS. The 2010-11 Performing Arts Series season will be announced and opportunity to buy tickets for next year at discounted price will only be available that night. Indiana State University's Performing Arts Series wraps up its 2009-2010 season on March 20 with "Oh Mr. Sousa!," a staged band concert show, highlighting major historic and amusing events in the life of John Phillip Sousa.